"Kuwae is a mainly submarine caldera (~10x5 km) that, according to C14 ages, Tongan folklore, and reconnaissance fieldwork (Garanger, 1972; Crawford, 1988), is probably very young (~1,500 A.D.). The caldera is located between Epi, Laika, and Tongoa islands in the central part of Vanuatu. During the ORSTOM-CALIS cruise in May 1991, detailed bathymetric and magnetic surveys of the collapse structure were made, and data are presently under analysis. August fieldwork was carried out on Tongoa and Laika Islands in order to study caldera eruption products, their composition, and their age. Several ignimbrite units, including non-welded ash and pumice flow deposits, and thick, complex sequences of poorly-welded to densely-welded tuffs, have been discovered. C14 ages will be determined for charcoal samples from these deposits. References. Crawford, A.J., 1988, Circum-Pacific Council for Energy and Mineral Resources: Earth Science Series, v. 8. Garanger, J., 1972, Publication de la Société Océanistes, no. 30. Information Contacts: C. Robin and M. Monzier, ORSTOM, New Caledonia; M. Lardy and C. Douglas, ORSTOM,Vanuatu; C. Mortimer, Dept of Geology, Mines, and Rural Water Supply, Vanuatu; J. Eissen, ORSTOM, France. The Global Volcanism Program has no Weekly Reports available for Kuwae. The following cable was received . . . on 23 February. "Submarine volcano Karua . . . erupted strongly 22 February 1971. Eruption commenced with explosions at about 0730 local time. Activity increased throughout afternoon. Eruption occurring from three closely spaced vents from which a mushrooming ash cloud rose strongly through the cloud base at about 1,000 m. Some large blocks of rock thrown up by explosions occurring several times each minute. Activity still strong at 1740 local time, but no visible sign of activity from village 5 km away at 1800. By 1030 23 February no activity at all except very minor water turbulence. Island of cinders about 200 x 70 m built to about 1 m above high tide mark. Surface of island studded with angular blocks up to 6 m3." Information Contacts: D.I.J. Mallick, New Hebrides Geological Survey, Port Vila, New Hebrides. "Although activity of . . . 22 February was reported to be much stronger than the last time an island was formed in 1959, eruption ceased quickly after only 1.5 hours. No recurrence of volcanic activity to 1000 local time 26 February, but series of earthquakes felt on Tongoa 5 km S of Karua. First shock about 2100 local time 24 February, intensity MM 6-7, duration half-minute. Some damage to older native houses, cracking of at least one sunken concrete water tank and collapse of section of coastal cliff. No casualities reported. Second shock about 2115 duration 10 seconds. Series of smaller shocks during night 24/25 February. Aerial reconnaissance 23 February regrettably made after all activity ceased." "On 22 February 1971, at about 0800, a known area of crustal instability began to erupt [at Karua], giving off clouds of steam and shooting black masses of cinder, ash, and pre-solidified crust up to 600 feet into the air. The activity intensified during the day with increasingly frequent explosions and clouds of dust being formed. At the height of the activity the eruption covered an area over one mile in diameter. Accompanying the volcanic explosions was tremendous thunder and lightning, precipitated by the intense heat of the eruption which led to condensation and great atmospheric instability. Then, very suddenly, at about 1800, the activity died away. "Ten days after the eruption, I went to the newly-formed land mass and found an almost moon-like terrain. The islet was flat with large boulders strewn about the surface. A few hot water pools were in evidence and there was a distinct smell of sulphur in the air. Underfoot the ground was still warm and when kicked smoke appeared from the ash and cinders of which the island was composed. On one side the sea was shallow for some distance but too hot to touch. This is the actual crater and the nucleus of all the activity. I estimate the island to be over half a mile wide and in the opinion of local pilots is easily large enough to land a light plane upon. Information Contacts: Richard J. Ellis, c/o B.D.A. Lakatoro, Lakatoro, New Hebrides. "Increased activity at this submarine was reported on 1 February when the sea above was apparently bubbling and a yellow discoloration was evident. However, when visited on 25 February only a greenish stain on the surface of the sea and a faint sulphurous odour were noted." Reference. Volcanological Society of Japan, 1979, Bulletin of volcanic eruptions no. 17: Annual report of the world volcanic eruptions in 1977: International Association of Volcanology and Chemistry of the Earth's Interior, IUGG, p. 27. Information Contacts: A. MacFarlane, Geological Survey Department, Vila, New Hebrides. The largely submarine Kuwae caldera occupies the area between Epi and Tongoa islands. The 6 x 12 km caldera contains two basins that cut the NW end of Tongoa Island and the flank of the late-Pleistocene or Holocene Tavani Ruru volcano on the SE tip of Epi Island. Native legends and radiocarbon dates from pyroclastic-flow deposits have been correlated with a 1452 CE ice-core peak thought to be associated with collapse of Kuwae caldera; however, others considered the deposits to be of smaller-scale eruptions and the ice-core peak to be associated with another unknown major South Pacific eruption. The submarine volcano Karua lies near the northern rim of Kuwae caldera and is one of the most active volcanoes of Vanuatu. It has formed several ephemeral islands since it was first observed in eruption during 1897. Monzier M, Robin C, Eissen J-P, 1994. Kuwae (~1425 A.D.): the forgotten caldera. J. Volcanol. Geotherm. Res., 59: 207-218. Nemeth K, Cronin S J, White J D L, 2007. Kuwae caldera and climate confusion. Open Geol J, 1: 7-11. Witter J B, Self S, 2007. The Kuwae (Vanuatu) eruption of AD 1452: potential magnitude and volatile release. Bull Volcanol, 69: 301-318. There is no Deformation History data available for Kuwae. There is no Emissions History data available for Kuwae. 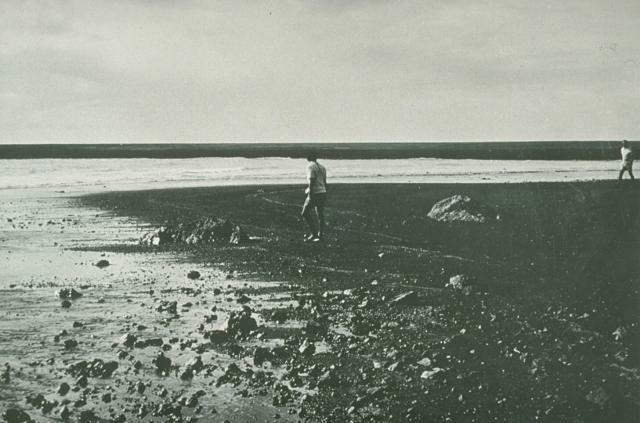 Ten days after a new island was formed during a brief, one-day submarine eruption in 1971, scientists investigate the surface of the new land. Ash clouds had been ejected to a height of 1 km. A low island 200 x 70 m wide had been formed, whose block-littered surface was one meter above high tide level. The Karua submarine volcano, one of the most active volcanoes of Vanuatu, was constructed within the 6 x 12 km Kuwae caldera. Photo courtesy Geological Survey, New Hebrides, 1971. 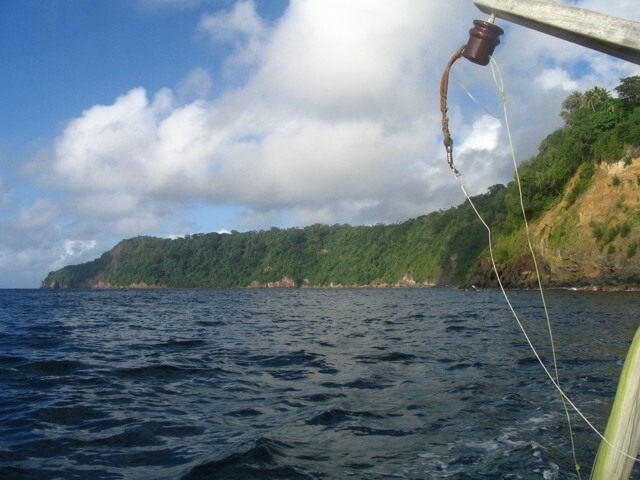 The mostly forested cliff marks the upper caldera wall of the largely submarine Kuwae caldera between Epi and Tongoa islands. The 6 x 12 km caldera contains two basins that cut the NW end of Tongoa Island and the flank of the late-Pleistocene or Holocene Tavani Ruru volcano on the SE tip of Epi Island. The submarine volcano Karua lies near the northern rim of the caldera and is one of the most active volcanoes of Vanuatu. It has formed several ephemeral islands since it was first observed in eruption during 1897. There are no samples for Kuwae in the Smithsonian's NMNH Department of Mineral Sciences Rock and Ore collection. Large Eruptions of Kuwae Information about large Quaternary eruptions (VEI >= 4) is cataloged in the Large Magnitude Explosive Volcanic Eruptions (LaMEVE) database of the Volcano Global Risk Identification and Analysis Project (VOGRIPA).